UPDATE: I apologize – I confused the federal funds that the 2008 Green candidate received with “federal matching funds.” The Saulny piece is right about that, and I’m wrong. Corrected text follows. And my old headline, referring to “Two Facts Missing” from the piece, has been boiled into a nice, warm paste I can eat with my crow. Not to knock the Times, because Susan Saulny’s longish piece is probably the most attention that Green Party presidential candidate Jill Stein will get in the paper. But why mention Ralph Nader’s role in the Green Party without getting into the ways he undermined it? Unlike Dr. Stein, Mr. Nader, a lifelong consumer advocate, enjoyed high name recognition. But now, more than a decade later, the Green Party has matured to the point at which Dr. Stein’s lower profile may be balanced by a more savvy political operation. 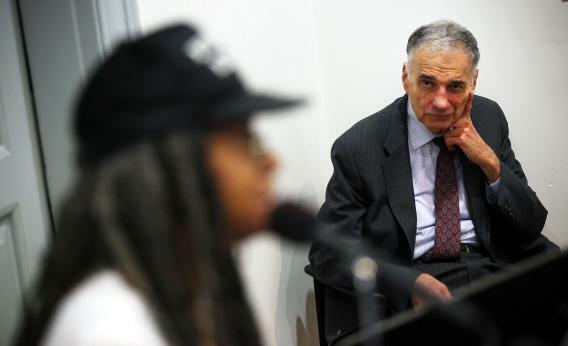 The biggest impediment to the Green Party’s maturation, though, was Ralph Nader. After the 2000 election, after several years of refusing to accept responsibility for squeezing Al Gore out of the presidency, Nader waffled over whether to run as a Green again. He’d never actually joined the party – he’s against that sort of thing – despite being its nominee in two elections. He met with Greens and gave some of them the impression he’d run again. Then, on Christmas Eve 2003, Nader announced that he wouldn’t seek the Green Party’s nomination, but he might run as an independent. You don’t need to know all of the kremlinology that followed, but the short version is that Nader declared an independent candidacy in January, splitting up the talent among left-wing organizers who knew how to get ballot access. The Greens proceeded to choose their own nominee. At the 11th hour, Nader asked Greens to join him (remember, he wouldn’t join them!) and nominate no candidate for president. They nominated one anyway – David Cobb. Nader proceeded to undermine him. The result? Total disaster. In 2000, Nader’s Greens had won 2,883,105 ballots, 2.73% of the popular vote, establishing themselves as the country’s biggest third party. In 2004, the lone Nader won only 463,655 votes (0.38%) and the Greens won 119,859 (0.10%), falling to sixth place. That was bad enough, but in 2008, Nader did the exact same thing. He improved to 739,278 votes (0.56%), while the Greens – who had chosen Rep. Cynthia McKinney to nominate them, something that might have been a PR coup – came in sixth place again, with 161,870 votes (0.12%). Nader’s transformation into a dogged spoiler candidate for other spoiler candidates is one of the great weird tales of fringe politics. In 1996, he only agreed to be the Green nominee if he could run an “un-campaign,” with no fundraising. In 2004 and 2008 he went all-out, earning more and more enemies. When [Stein] officially accepts the nomination at the Green Party’s convention this weekend in Baltimore, she will be the party’s first candidate to have qualified for federal matching funds — a milestone for this 11-year-old alternative party and potentially a major boost for a campaign that does not accept corporate donations. The basic premise of the Times piece is true. There might be enough angry liberals in one or more states to vote for the Greens over Obama, and flip the electoral vote. But the best thing the Greens have going for them is that Nader seems to have moved on. (He co-chaired an abortive effort this year to run primary challengers against Obama.) There’s no other evidence that they’re strong, at all. UPDATE: Derek Wills points to the exact FEC page that records the McKinney funds. I fully expect Stein’s Greens, with no competition from Nader to worry about, to go through the funding process more quickly, and secure the money before the election. But the old Green dream was for a giant check that made them competitive across the country. I’d just point out that Pat Buchanan got that in 2000, by securing the Reform Party nomination, and went absolutely nowhere.